the "regular" release has the very same back cover with the very same red letters and the very same etchings, so how is this one different??? 1985, when this album came out, there were certain vectors that let to an album of this type to be created. Europe had it's electronic music experimentalism revving up big time: In Italy/ Germany/ Spain the sound of what now we know as Italo IE synthpop was blossoming. From the UK the powerful New Romantic electro pop sounds was lighting up radio stations (and clubs) worldwide; And of course by the mid 80's the world was seriously infatuated with New York 's own : electro -hip hop. In that context- where was the West Coast ? parallel to the East Coast's underground electronic music scene (from which came Newcleus, Afrika Bambattaa and the Soul Sonic Force, Hashim, Man Parrish, The whole Wildstyle culture), California let loose an electro sound that thunders down the streets and can rival that of the East Coast's anyday. Enclaves of fashion enthusiasts, art creators, dancers, musicians, djs, and party people joined together and inadvertently developed an incredible movement that to this day is legendary. Street DJs such as Egyptian Lover, Arabian Prince, DJ Unknown, & Dr Dre among others pioneered a style that is a hybridization of Kraftwerk meets Prince meets Grandmaster Flash . While The electronic hip hop sound from the East Coast seemed grittier and more "urban" , the version that came from California had that whole "california dreaming " attitude and a more "suburban " cultural slant. 808s drum machines, vocoders, sinister melodies, and raps about futuristic adventures perhaps are the key ingredients in this sound. 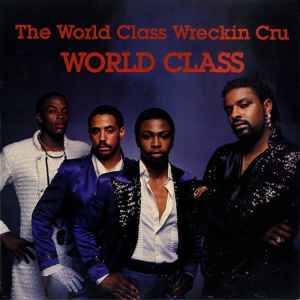 This particular album "World Class" - hit the streets like a bomb, its jam packed with incredible iconic robot funk the likes are still hard to knock. So why mention Italo, New Romantic, and NY Hip Hop during the review of "World Class" ? because this Lp has all these tendencies within its makeup ( no pun intended: as various hip hop journalists always make note that the whole Crew is wearing makeup ala Prince on the cover). Just glance at the "Look" of the electro band on the cover, they look more Duran Duran newwave in appearance than what we would see on East Coast hip hop acts (which usually look and sound more "street" than "fantasy" ). To be honest, I find imaginative electro rap much more interesting than gangsta rap: I think it would be fantastic to see Dr Dre return in sequence & makeup to release more Electro music on the futuristic tip again now that he is a billionaire. This record is packed with classic electro cuts - Definitely one for fans of tough drum machine and vocoder heavy electro delivered at a fast pace. This album is also Worth buying for the cover alone - Dr Dre doesn't look so tough in a white sequined jumpsuit!